Delivered to USAAF as 44-83514, 19??. - Retired to Davis-Monthan AFB, AZ. January 27, 1959. Acme Aircraft Parts, Compton, CA, July 31, 1959-1960. Western Air Industries, Anderson, CA, November 1960-1962. - Converted to fire tanker #E17, 1960. - Flown as #C17 & #17. - Restored to military configuration as USAAF 483514/Class of 44, 1977. Confederate Air Force, Midland, TX., January 17, 1978-2002. - Damaged during landing, Burbank, CA, November 1988. Commemerative Air Force/Arizona Wing, Mesa, AZ, 2002-2017. 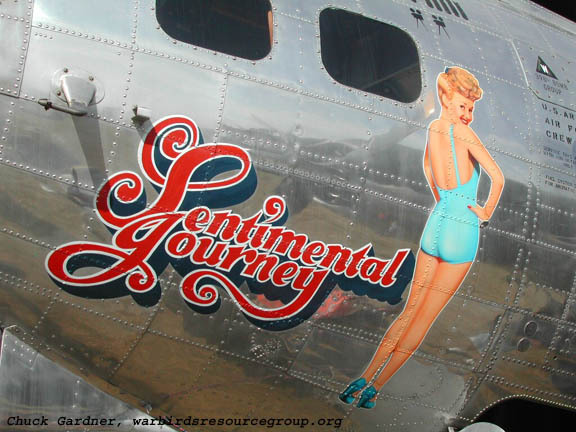 - Flies as 483514/Sentimental Journey.